Dimensions:	84" x 84" x 38"
Weight (dry/full): 935 lbs. / 4,775 lbs. QuietFlo Water Care System: An advanced circulation pump that enhances the purity of the water. 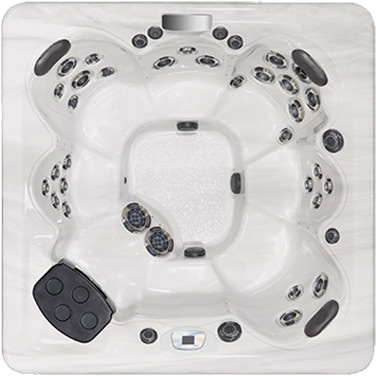 Vac Formed ABS Pan Bottom: A high density polymer base that helps keep heat in and unwanted pests out. Extended Warranty (Upgrade 3 years to 5 years Parts & Labor).